10. WHAT THE POLICY DOES AND DOESN’T COVER. Most insurance policies cover damages like fire, certain natural calamities, theft or even vandalism. It also incorporates liability coverage if you are sued. Earthquakes, sinkholes or flooding is not usually covered in insurance. Make sure you talk to your insurance agent in details so that you know what you are applying for. You should know all the specific events that will be covered in the insurance. Every small detail needs to be known by the house owner before they sign anything or they buy homeowners insurance. If you live in a place which is prone to natural disaster or is a high crime area you are most likely going to pay more for the insurance. Before you sign your agreements you should consult and get an idea about the homeowners insurance rates near the area you are planning to live in. Insurance companies are more like to provide you with an estimated cost for the homeowners insurance. 8. IT PAYS TO SHOP AROUND. Don’t go with the first quote you get. Always look around and differentiate quotes. Quotes can vary drastically—sometimes by over 100 percent. Before you own a homeowners insurance, try to get at least three rate quotes from different companies to make sure you’re getting the best deal for the coverage you need. 7. BUNDLING HELPS YOU SAVE. Bundling your homeowners’ insurance is a great idea. Getting your homeowners insurance from the same company that insures your vehicles and other things will save you money. So it might be a great idea to contact them first. You’ll still want to shop around to be sure you’re getting the best homeowners insurance policy for your money, but don’t forget the companies that currently provide you with property loss coverage, as they will often give current customers privileges for having multiple policies with them. 6. SAFETY MEASURES CAN ALSO SAVE YOU MONEY. Protecting your home by setting up a security system, deadbolt locks, or fire sprinklers can be budget friendly. These extra changes will enhance the policy and provide peace of mind at the same time. Security systems and advanced fire protection systems will not help to lower your homeowners insurance rates, but they can ensure priceless peace of mind too. 5. “TOYS” CAN BE COSTLY. Trampolines and swimming pools on your property are considered very risky because they can be the initiator for personal injury and/or damage to the property. As a result, they will likely increase the cost of your homeowners’ insurance premiums. It is essential to remember this when you are comparing around the rates when you are looking to buy homeowners insurance. 4. YOU MIGHT NEED EXTRA COVERAGE. Art or jewelry will require additional coverage. These are called riders because it rides on your existing policies. Many couples are very sensitive about their wedding rings, so they get the rings insurance if they cost more than the insurance deductible. 3. BE SURE TO CHOOSE THE RIGHT DEDUCTIBLE. A $10,000 deductible may have average low monthly payments, but if you needed to file a claim, could you afford to give out $10k before you’d know more about benefits? Choose a deductible you can comfortably afford, an amount you know you can pay anytime, whether that be $700 or $5,000. You can re-analyses your ability to pay a higher (or lower) deductible at a postponed date if you wish– but don’t choose an astronomical deductible now. Select your deductible wisely because this might cost you a lot in the future. 2. KNOW THAT CONDO INSURANCE IS DIFFERENT THAN HOMEOWNERS INSURANCE. If you are buying a condominium, you should have the knowledge that the insurance plan you will need is only addressed to condos. Condo insurance is a special owner’s insurance policy for those who are the owners of condominiums instead of single family home residences. Be informed about the difference before you buy homeowners insurance or condo insurance. 1. KNOW THE DIFFERENCE BETWEEN REPLACEMENT COST AND ACTUAL CASH VALUE. Replacement cost is the amount of cash it would cost to change your items with the same or substitute item. Actual cash value (or ACV) covers the things you own, for the amount they’re worth at the time of loss, which most significantly less than you is bought when deflation is taken into account. 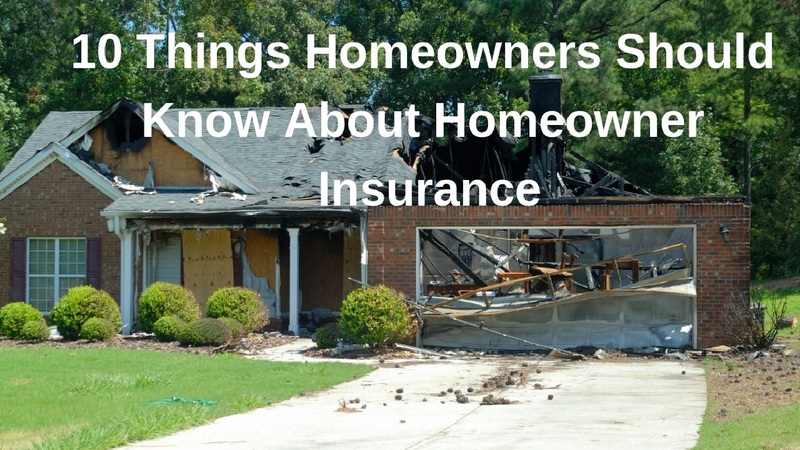 Hopefully, you’ll never need to claim a homeowners insurance. Even if you do, however, owning the best coverage for your necessities and budget will make the process go smoothly. If you’re thinking about refinancing, now is a great time to re-evaluate your homeowner’s insurance needs. Before you submit the wanted documents to refinance your mortgage, think about getting an extra quote or two for a new homeowner’s insurance policy to see if you might save more money with a different company than the one you’re currently using.